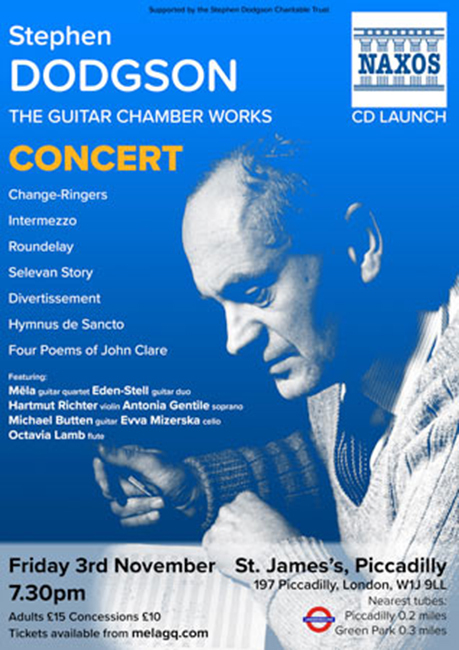 Stephen Dodgson (1924–2013) was a British composer, born in London, and despite not being a guitarist himself, produced a considerable repertoire of works for the instrument, inspired by his musical connections with Julian Bream, John Williams, Paco Peña and the Eden-Stell Duo, to name just a few. I took to the guitar through him really; very simply and easily. He asked me to write music for him, which I attempted to do. I wrote a piece … Prelude Nocturne and Toccata. Julian Bream played these quite a lot, particularly the Nocturne which, quite rightly, he thought was a little better than the other two, and he encouraged me to write more things … Respect for music must be won out of the music itself. I love that about him. I think that it is this instinct, a great personal instinct which is his great attribute. Stephen Dodgson was Professor of Composition and Theory at the Royal College of Music from 1965 until his retirement in 1982. It was there that he met John Williams, who was his student of music theory – John Williams premièred Dodgson’s Guitar Concerto No. 1, and the Guitar Concerto No. 2 was written for John Williams. So strong was Stephen Dodgson’s connection with the guitar that he even attended guitar festivals, such as the Toronto Guitar Festival (for which he wrote the Divertissement) and the Esztergom Guitar Festival (for which he wrote the Intermezzo). The concert this evening will be a special event; it is at St James’s Piccadilly, 197 Piccadilly, W1J 9LL, 7.30pm. Tickets.